Options expiration on September 21, 2018 claimed one of the stocks in the 2018 Covered Call Portfolio. Qualcomm, symbol QCOM, was "called away" also known as assigned. I am very happy with the income produced from this little portfolio but as with all covered call strategies, when your underlying stock is called away, you have to find another stock in which to invest. In addition to QCOM being called away, Gilead's call expired. 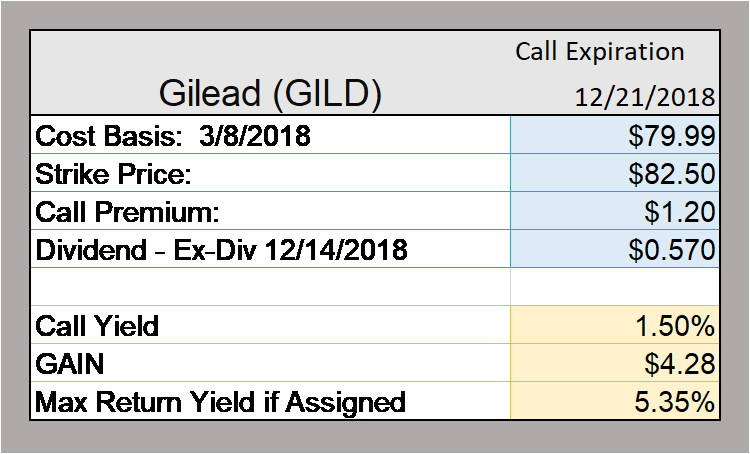 I sold another call on Gilead today. This call is presented in the table below. And, I have posted the updated 2018 Covered Call Portfolio as well. Options expiration is always a challenging time for income investors. Usually 90% of options expire but this time I had 20% of my calls exercised. That means I have to move some money into another income instrument. I like value and am intrigued with Las Vegas Sands, symbol LVS. At a close to a 52 week low, LVS and sporting a yield north of 4.5%, it is worth a close look. Last week I did add Novocure, symbol NVCR. This stock has no dividend so be ware. However, I like a lot of what the company has to offer and will write up more about NVCR later. I am not selling any stocks in this portfolio. That "dog" RIOT is still there. I do create cash from calls that are assigned. Currently I have about $30,000 to invest. The point of this little portfolio is income so I will not be buying a CD (certificate of deposit) with this money. Stay tuned. The next 10 years of this blog will be a little different. But we can always measure how the $750,000 invested since 2011 has done.